Prior Forecasts: Past years’ winter and summer outlooks are maintained on my website: http://www.lightinthestorm.com/ Since the outset in 2006, the verification has been 82%. Abstract: After multiple, successive winter seasons typified by negative ENSO conditions in the Pacific, a material alteration in the thermocline structure, walker-cells, and concomitant pressure pattern has occurred. The progression toward El Nino has been quite mercurial in that westerly wind bursts, surges of positive frictional torque, mountain torque, and angular momentum have generally been rapidly countervailed by diminutions in those values. This atmospheric warfare may persist to a certain extent, but eventually Nino-esque predilection will predominate. Global temperatures have cooled in comparison to prior years; although, anomalies are still modestly warmer than normal in the northern hemisphere. We continue our descent into the minimum of solar cycle 24, with a significantly reduced output of geomagnetic activity compared to the past few years; solar flux is suppressed quite low, and sunspot activity has been diminutive. The Atlantic sea surface temperature structure remains redolent of a warm Atlantic Multidecadal Oscillation, and the Pacific is likewise, in a warm phase. Going forward into the ensuing cold season, one of the most salient variables, invariably, will be the accurate prognostication of the tropospheric polar vortex intensity, proxies for which are the Northern Annular Mode / Arctic Oscillation and North Atlantic Oscillation. 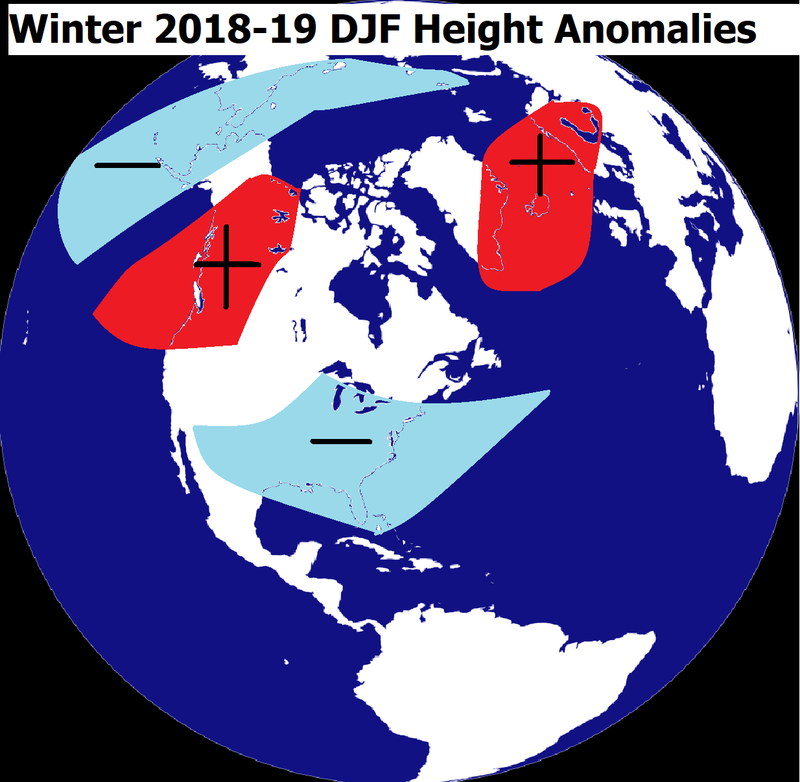 El Nino winters wherein the North Pacific and North Atlantic operate adjunctively with dual favorability feature much different sensible weather results than El Nino winters of only single domain favorability. Hence why it is highly salutary to accurately predict NAO behavior at longer lead times if possible, particularly in terms of Northeastern US winter weather. Contemporaneously, of course, it would be apocryphal to assert that the Pacific pattern is comparatively less important. It is axiomatic that the north Pacific atmospheric structure strongly modulates downstream weather, and weak-moderate El Nino north pacific patterns feature quite a bit of heterogeneity, historically. Specifically, Alaskan-low/British Columbian trough years induce largely warm CONUS patterns whereas Aleutian Low/E Alaskan ridge patterns produce the converse: colder CONUS. The discourse herein will expound upon these topics with the sensible weather prognostications thereupon. The genesis of a weak El Nino event has occurred, and accordingly, the sea surface temperature anomaly profile in the central Pacific is highly reflective of a positive/warm ENSO event. SOI values have been redolent of neutral ENSO, as the 30 day running SOI value is around 4.7, and October’s mean SOI value was 2.61, following September’s -8.5 (more indicative of El Nino). 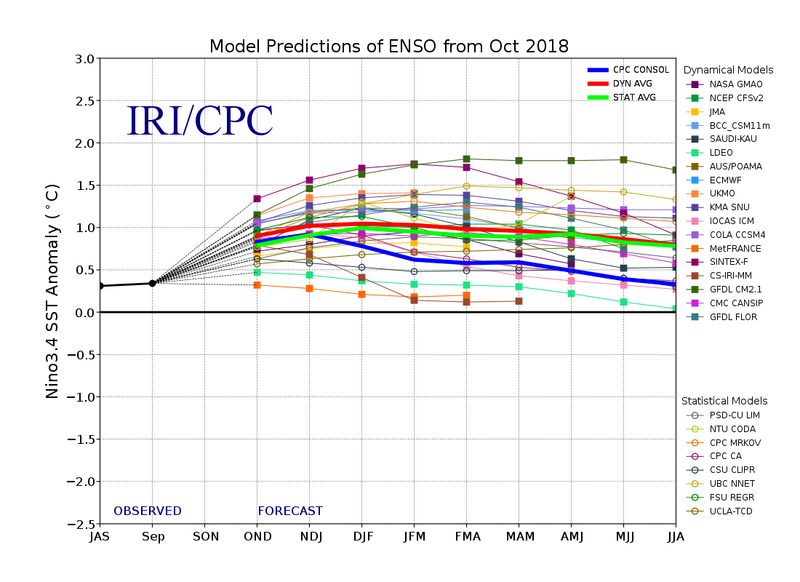 It is possible to have spasmodic SOI fluctuations such that some months are Nino-esque while others are not; however, the totality of the oscillations suggest very strongly that the ONI (Oceanic Nino Index) is unlikely to exceed low-end moderate El Nino status. I expect that the ONI peak will fall within the range of +0.8 to +1.0c, with low probability of exceeding +1.0c. The following is the IRI model output which accords with my postulated peak numbers. Atmospheric angular momentum (AAM) has generally been running on the negative side from late summer 2018 through mid-autumn 2018, suggestive of greater easterly wind stress in the atmosphere. While this is a La Nina signal typically, AAM can be negative through El Nino winters, wherefore, the resultant sensible weather patterns are quite different. However, westerly momentum has increased in recent weeks, in response to more frequent positive frictional and mountain torque event propagating poleward through the atmosphere. These westerly additions have begun to alter the hemispheric and global flows. Concordantly, an El Nino-esque z500 pattern will continue to develop down the road. It is also salient to note that many of the moderate to strongly negative AAM El Nino winters featured much colder Pacific SSTA (sea surface temperature anomalies), as negative/cold PDO (Pacific Decadal Oscillation) have been shown to retard westerly wind flows, concomitantly enhancing base state easterlies. Accordingly, a positive/warm PDO will aid in obviating persistent, deeply negative AAM periods over the coming months. Furthermore, the velocity potential z200 structure is redolent of a west based El Nino event. This will be one of the most west-based Nino events in database, not insofar as the putative “modoki” SST calculation, but pertaining to the actual walker cell orientation and concomitant uplift zones. Intermittent westerly wind bursts and attendant enhanced convergence near and west of the international dateline are likely over the coming months. There may also be significant off-equator forcing in the sub-tropical areas near/south of Hawaii, extending a bit eastward. The sub-tropical jet should be activated compared to normal. MJO cycling, as reflected by autumn analogs, sea surface temperature anomaly trends, and anticipated physical forcing, will produce conditions felicitous for MJO phases 7-8-1-2 in particular. The sea surface temperature structure; the precursor tropical forcing pattern; and British Columbian “correlate” as I term it, all indicate increased probability for higher than normal geopotential heights in British Columbia, eastern Gulf of Alaska, eastern Alaska and western Canada, in concert with an Aleutian Low feature, displaced slightly west of normal. Geopotential height patterns near British Columbia in late autumn have yielded approximately a 0.7 correlation with ensuing winter geopotential heights in that region. See the below image depicting z500 geopotential heights over the past few weeks. This pattern over W North America is likely to recur in the ensuing winter. It follows that my anticipation is for a largely negative East Pacific Oscillation, and positive Pacific North American Index. Turning to the Arctic and Atlantic, there are multifarious indicators under consideration. The Brewer-Dobson Circulation has been strengthening in recent days, as one can observe via cooling tropical stratospheric temperatures; this has shown to be an invaluable proxy which augurs polar stratospheric temperature increases as a consequence of heightened ozone concentration. Ozone has been running higher this autumn compared to the past few autumns. The Quasi-Biennial Oscillation (QBO) is now solidly positive at the 30mb atmospheric pressure level – estimating between +5 to +10 (the October value was slightly negative – but it is now solidly positive). However, the 50mb QBO value is still circa -10, and will remain negative through November, December, and January, with a probable flip positive sometime in February. The 50mb QBO modality reversal typically lags the 30mb alteration by 3 months. The vestiges of easterlies in this layer are an integral difference from other winters wherein 30mb through 50mb are moderate to strongly positive. Nevertheless, the increased westerly shear stress in the upper levels will tend to enhance zonal winds 60N/10hpa at times. Solar flux is running quite low, as we descend into the minimum of solar cycle 24 (which is still at least 1 year away). Flux values have generally hovered around 700 or slightly lower. Suppressed solar forcing in concert with increasingly westerly shear stress due to the positive QBO will act to stabilize the upper level stratospheric vortex, and destructively interfere with sudden stratospheric warming events. Geomagnetic activity is very low, with the 30-day running value around 7, indicative of a steep decline from previous autumns. Energetic electron precipitation is suppressed versus prior years, and will be below normal. Concordantly, ozone will be higher than normal in some parts of the Arctic Circle. Asian mountain torque activity will be higher than normal this winter, and coupled with other propitious tropospheric factors such as MJO cycling, will aid in increased vertical energy transfer. The Tamyra region, Barents-Kara Sea precursor geopotential height indicator is suggestive of a weaker than normal tropospheric vortex this winter. Higher than normal geopotential heights near this region in late autumn are indicative of heightened wave driving and negative northern Annular Mode / Arctic Oscillation approximately 70% of the time. See above z500 image for higher heights over the aforementioned region Oct 17-Nov 8; the coming weeks will feature a similar z500 pattern. Aforementioned conducive variables, with favorable wave driving, tropospheric forcing, among other factors will produce a negative Arctic Oscillation (AO) for DJF, though not strongly so. There will be some destructive interference from attempted down-welling of a stronger than average upper stratospheric vortex. However, significant perturbation is expected from the mid/lower stratosphere through the troposphere. So while zonal winds at 60N/10hpa may run above normal, zonal winds at 70hpa may run near normal or below normal, and at 150hpa below normal. In light of the combination of factors discussed, tropospheric blocking will be greater than normal, but I anticipate that there will not be a technical sudden stratospheric warming event in the meteorological winter. However, this will be immaterial insofar as the impact on the tropospheric sensible weather pattern. Analogs were exceedingly sparse this year; the highly heterogeneous nature of this season’s indicators is such that sufficient commonalities were limited. The only analog that attains my threshold of featuring sufficiently high similarities is 1963-64, which is my primary and only analog for this winter. The AO average for DJF in 1963-64 was -0.46, and the NAO average was -1.43. The PNA averaged +1.06 and the EPO averaged +0.69. The primary disparity I anticipate here is a more negative EPO and a less negative NAO, compared to the 1963-64 values. 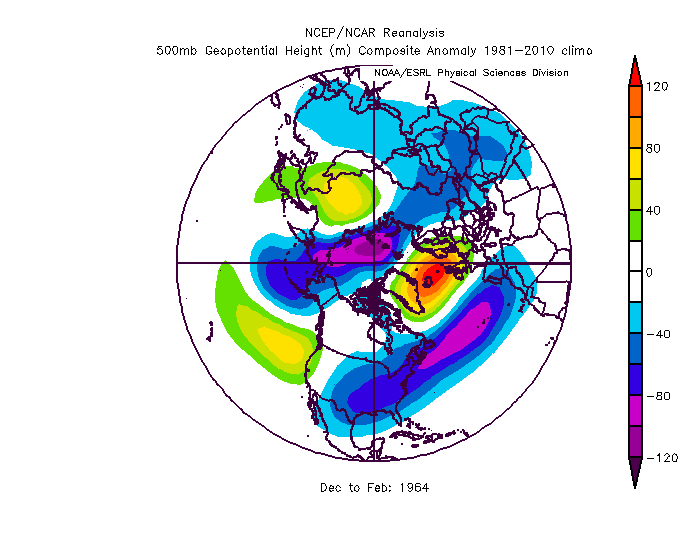 The ridge/trough orientations in the mid-latitudes will be retrogressed westward somewhat compared to 1963. 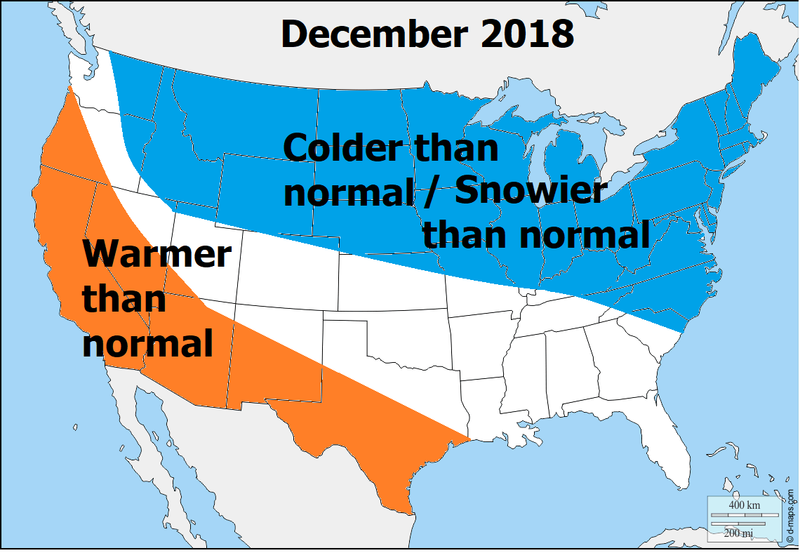 This will be my first winter outlook in 5 years (2014-15) since I forecasted colder than normal temperature anomalies in the Northeastern US. 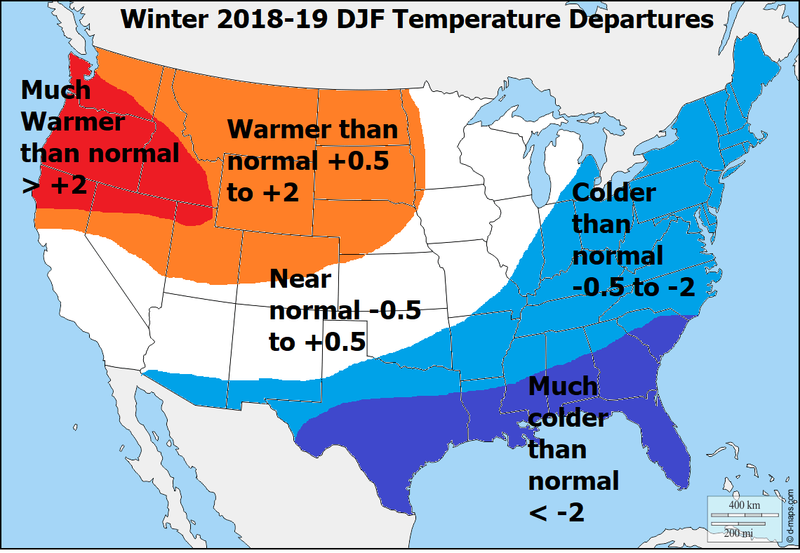 The indicators are suggesting very strongly that DJF temperature departures below the mean is a high probability event. While snowfall is much more difficult to prognosticate, a snowier than normal winter is likely for much of the Northeast corridor and Mid-Atlantic. There are a minority of indicators that may obviate the putative widespread “blockbuster” winter, but regardless, the majority of indicators are suggestive of a colder and snowier than average season in much of the East. As depicted in the 500mb anomaly forecast there are two principal keys to the success of this forecast: the verification of a trough-ridge couplet in the Aleutians and E GOA respectively; and, the verification of an east based negative NAO mean signal. The AO domain blocking will not be as significant. The exogenous indicators will evolve such that lower than normal geopotential heights / trough becomes preeminent in the Aleutians region; higher than normal geopotential heights / ridge over E GOA and W Canada and the Western US; downstream, a trough should encompass much of the area from the N-Plains through the Northeast. The PNA (EPO) will be positive (negative) and the AO/NAO will be negative. 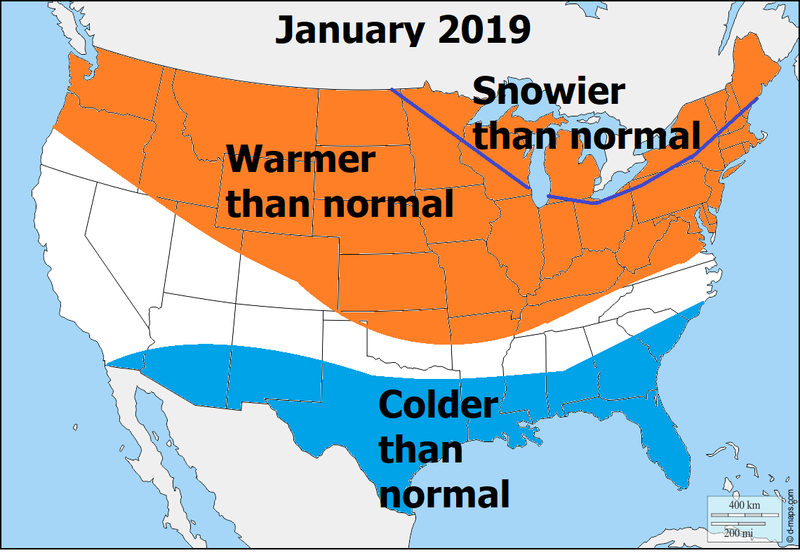 Concordantly, for the first time in several years, a large percentage of the Eastern US should experience colder than average temperatures for the month. The walker-cell structure will be such that the mean ridge/trough action centers will be retrogressed a bit further west compared to the analog year (1963-64) and the putative “canonical” look for an El Nino; namely, cool anomalies should prevail from portions of the NW US eastward through the Northeast. The sub-tropical jet (STJ) should become active with wetter than normal and snowier than normal conditions. Most of the Northeast corridor will have the first real chance of a white Christmas in almost a decade. The data analyzed suggests, quite incontrovertibly, that a relaxation in the synoptic pattern will occur, such that the poleward W-Canadian ridging reduces in magnitude. However, there may still be some vestiges of high latitude blocking that capture somewhat stale continental polar air, precluding locations in the southern/eastern part of the nation from experiencing blowtorch departures for the month. The STJ will continue to be enhanced with respect to normal. Temperatures should be warmer than normal across most of the Northern tier (though not blowtorch in the Northeast corridor: only slightly warmer than average), and cooler than normal across the South, wherein precipitation will be quite frequent. Snowfall will be near-normal in the Mid-Atlantic and portions of the Northeast, and above normal in interior/northern New England. The data strongly suggests that February will be the snowiest month relative to normal. Whether it will be the coldest month relative to normal is more indeterminate; 1963-64, the primary analog year, featured its coldest departures relative to normal in December. The weight of other analogs indicated otherwise; however, the commonalities in those years were quite a bit less compared to 1963-64. In light of the indicators analyzed, it is quite possible that December turns out to be the coldest month relative to normal. I am not ruling that out as a possibility. Regardless, December and February should be colder than normal in the Northeast corridor. Snowfall and precipitation will be above normal in areas that normally receive snow in the East. This month (Feb) has the highest probability of a major or greater magnitude event. The trough should retrogress into the W/Central US with normal to warmer than normal temperatures returning to the Eastern US. Blocking should begin to decrease adjunctively with lowering geopotential heights in Western North America. Snowfall should be below average in the Northeast corridor and Mid-Atlantic (much different than last winter) and above normal in northern New England, as the storm track retrogresses farther west. Thus, I am anticipating the majority of winter’s snowfall to occur within actual “meteorological winter” this year. 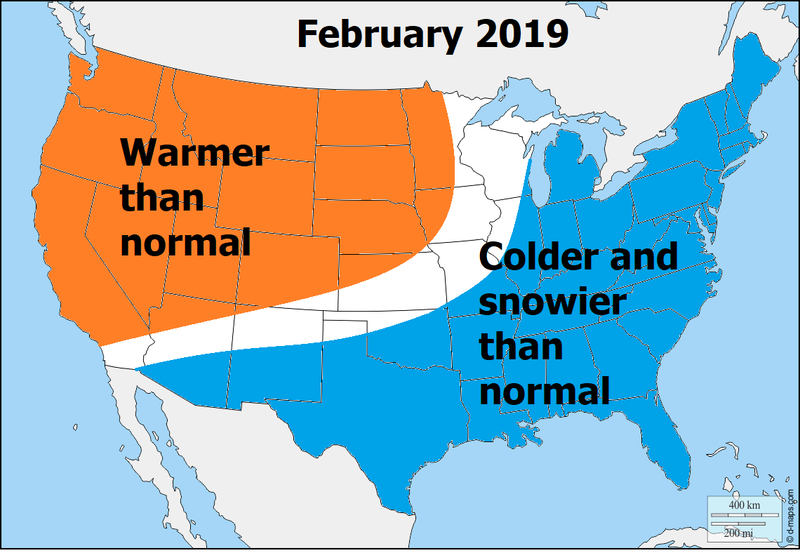 The months of December and February should be the snowiest, and coldest with respect to normal. A colder than normal December is likely, followed by a warmer than normal January, and colder than normal February. The provenance of this outlook’s reasoning emanates from the factors delineated heretofore. 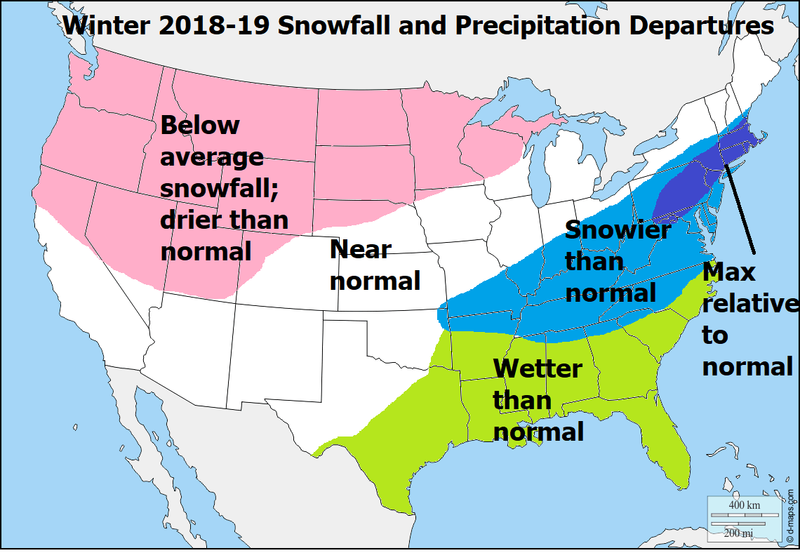 Snowfall will be above normal in December. Prodigious amounts are not expected, but a major event cannot be ruled out. January will feature a more tepid atmospheric structure with lower-end snowfall potential. February is anticipated to feature the highest probability of a high-end snowfall event. The winter’s meaningful snowfall opportunities should dwindle rapidly following the end of February. The expectation is that this will be a winter with frequent Miller B events, and to a lesser extent Miller As. Concordantly, locations north of Philadelphia will be most favored with respect to maximum snowfall anomalies. Snowfall forecasting is inherently mercurial and lesser confidence than temperature forecasting. The ranges provided below are best, educated guesses given the expected physical forcing. The take-away message here should be a solidly snowier than normal winter, probably significantly so, for most of the Northeast corridor.